Cadac Grillogas BBQ for camp cooking breakfast, lunch and dinner. Great for camping and caravans. Three cooking surfaces for great options when cooking outdoors. Includes pot stand which can accommodate a whole range of cooking pots. Fully collapsible tripod legs and also includes carry bag for storage. Works from Campingaz 904 and 907 refillable cylinders. 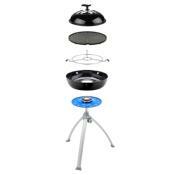 Cadac Grillogas Chef Pot Stand. Included With Your Grillogas BBQ. Cadac Grillogas Ribbed Griddle Plate. The ribbed which is ideal for fat-free barbecuing of meat.